According to the report 'Middle East Wind Power Market Outlook, 2019-2028’, developers will build 6.2GW of wind capacity – 46% of the region’s total wind capacity addition – between 2019 and 2028. Commenting on the findings, Sohaib Malik, Wood Mackenzie Power & Renewables Senior Analyst, said: "The integration of renewables in Vision 2030’s objectives underlines strong political commitment within Saudi Arabia. The level of Saudi ambition for wind and solar PV varies significantly, despite the cost parity between both technologies during the first round of tenders in 2018. "The 300MW Sakaka PV project was awarded to ACWA Power at 23.4 USD/MWh and the 400MW Dumat Al Jandal wind project at 21.3 US$/MWh to EDF/Masdar. Despite offering comparable prices and more rigorous industrial development opportunities, the wind power capacity target is set at 16GW by 2030 and solar PV at 40GW, indicating the government’s preference for the latter. Moving forward, the Renewable Energy Project Development Office (REPDO) will award 850MW of wind capacity in 2019, which is expected to be commissioned in 2021-2022, and increase the local content requirement in future tendering rounds." Despite growth projections and imminent regional leadership, Saudi Arabia will fall short of its current 2030 renewables target. "In January 2019, the Saudi government revised its renewable energy targets upward resulting in enhanced visibility through 2030. It earmarked 70% of target renewables capacity for the Public Investment Fund (PIF), the Saudi sovereign wealth fund, while the remaining capacity is to be awarded through REPDO. 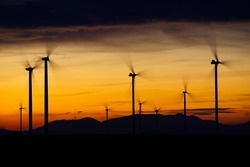 The new mechanism highlights concerns that will define the future of Saudi Arabia’s wind market. "A central concern is the PIF’s lack of track record in the renewables sector and its limited in-house sectoral expertise. REPDO, on the other hand, completed two renewables request for proposals after pre-developing the sites. PIF is estimated to have $230bn of assets – targeted to reach $2trillion under Vision 2030 – driven by investments in a variety of sectors ranging from electric vehicles to public infrastructure. “There is little doubt about the Fund’s financial muscle, however its past investment strategy focused on established firms in traditional industries. Aspirations to develop a value chain for wind and PV technologies locally is a different ball game and requires the PIF to acquire new capabilities for effective oversight of these ventures,” said Mr. Malik. A new report assesses the impact of a hard Brexit on the UK's offshore wind industry. Would a hard Brexit also mean hard times?